Please refer to our stock # 8916 when inquiring. 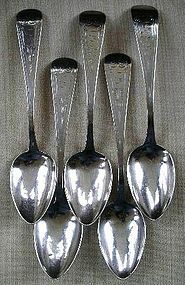 Five Early Philadelphia Engraved Tablespoons, c. 1846. By Robert and William Wilson. Marked R&W WILSON, PHILADA. Condition: Two have a very slight bend of the bowl and some teeny tiny dents in bowl. The tips are excellent. 8 1/2 inches.